I thoroughly enjoyed our stay at the exclusive and historically-unique Hotel Principe di Savoia Milano earlier this month. 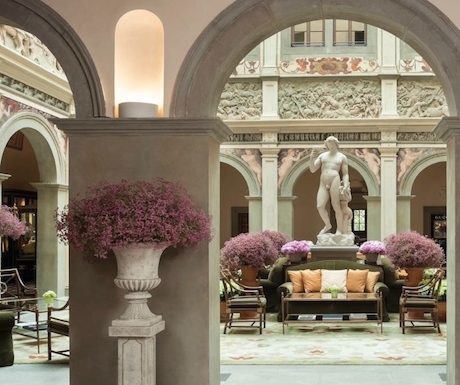 This member of the Dorchester Group is one of just two Milanese hotels that make it into the Condé Nast top 700 hotels in the world. Occupying a great location on Piazza della Repubblica, it is just 5 minutes from Milan’s central station and within easy of some of the city’s main attractions such as the Duomo and Castello Sforzesco. What was particularly exceptional about the hotel – for me, at least – was the quality of the staff. From reception to room service and beyond, everyone was utterly charming and professional. We really were made to feel particularly welcome, and the staff continually fussed – in a nice way – over our children! We had a beautifully furnished and spacious Deluxe Room on the sixth floor – room 619. The accompanying bathroom was decked from head to toe in Italian marble (as is the case, I think, with all the bathrooms in the hotel’s 401 rooms and suites), with ample, complimentary Aqua di Parma toiletries. Our children were given their own wonderful bathsets which consisted of fun ‘duck’ robes (with eyes and beak on the hood) and matching slippers. Reading material within the room included issue 14 of the hotel’s own bi-annual magazine, along with information on the hotel’s new Acanto restaurant. We didn’t make it to the restaurant in the evenings but did enjoy the buffet breakfast there which consisted of a wide spread of cereals, cold meats, smoked salmon, cheese, etc. and ample cooked options to boot. Small pets are allowed at the hotel, as evidenced by the ‘per fido’ section of the room service menu. Yes, you’ve guessed it… you can even order room service for your beloved pooch. With prices starting at 25 euros, I’d be interested to know how many spoilt canine visitors the hotel entertains and whether the tartare of veal is normally enjoyed ‘cotta o cruda’ (cooked or raw). On the top floor of the hotel is The Club 10 Fitness and Beauty Center which consists of a gym, pool and treatment rooms, and a colourful rooftop terrace with fabulous views over Milan. One of the new treatments on offer at the beauty centre is the Caviar & Retinol Multiaction Treatment which combines caviar and retinol to improve skin texture, tone and elasticity. Also on the rooftop is a tranquil pool (we were invariably the only ones using it when we visited) where our elder son made his first inroads into learning to swim! The remainder of the hotel’s top floor (approximately half) is made up of the Presidentail Suite which has, over the years, played host to countless celebrities and heads of state. Rumour has it that the 13,000-euro-a-night suite is about to get a facelift. As a member of the Dorchester Group – along with the likes of The Dorchester, London, The Beverly Hills Hotel, Beverly Hills, Le Meurice, Paris and Hôtel Plaza Athénée, Paris – it perhaps ought to be no surprise to find that this hotel actually surpasses all expectations. If you’re visiting Milan, I would highly recommend the Principe. If you already live in Milan… well, why not drop and treat yourself to afternoon tea? Or visit on a Monday or Wednesday evening if you’re a fan of jazz and you’ll be treated to a live concert in the hotel’s Winter Garden. I’ve read rave review of the principe de savoia in milan when you were there with your two children. Did they let you all stay in a room together or did you have two connecting rooms? How long would you say the walk to the Duomo is from the Pza. Repubblica? We are also traveling with our two children and are looking for a nice place in Milan. ps. I like your site and I have checked out the Westin promotion you posted too. Hello Jessica, and a warm welcome to A Luxury Travel Blog. I’m pleased to hear you like the site. Myself, my wife and our two young boys all stayed in a single suite together. However, both boys were in cots at that time (I dragged them out of shot for the photograph that you see!) so I am not sure if you’d have to opt for interconnecting rooms if you’re children are older. The Principe di Savoia is not one of the most central luxury hotels in Milan but it is still within easy reach of the Duomo. You just head primarily down Via Alessandro Manzoni and you can be there in about 15 minutes.